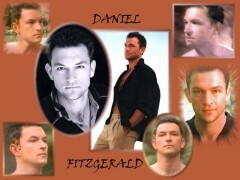 Welcome to the Daniel Fitzgerald Fan Area within the Mydlands! When I initially started building my Mydlands site over a year ago, I noticed that I had much more information about Sharak and the actor who plays him--Daniel Fitzgerald. I figured I had to put all that information in one place to make it easier for fans to access. That's how this little fan site to the character and the actor were born. Most of the information on this page pertains to Daniel's character Sharak and his appearances on BeastMaster. As Dan's career grows, so will this site. Many thanks to Dan who found my site very early on and wrote to me. He became someone I considered a real friend. Disclaimer: BeastMaster, the character of Sharak, and images are the property of Tribune Entertainment. This fan site is my own work, © Keeper of the Sharak.